Wherever proximity or neighborhood are to be altered, improved or preserved, wherever for this purpose is being planned, built and administered, current and reliable information on topograpy and inventory of the real world is required in professional form and to precise scale. Precise reference frames need to be established, points and axes staked out and newly built objects be surveyed. 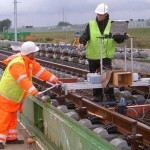 Cutting edge survey concepts have to be applied to the individual needs and conditions of each project. They have to be implemented, realized and controlled. Sometimes even specific survey systems are to be designed and realized in order to support the project optimally. bw engineers’ surveyors are optimally educated and equipped for these duties, with the newest instruments, spacial sense and longtime experience. The new Stuttgart Trade Fair Centre comprises the Trade Fair Centre including multistory parking over the A8 autobahn and a further 1,800 parking spaces, as well as the external transport infrastructure.